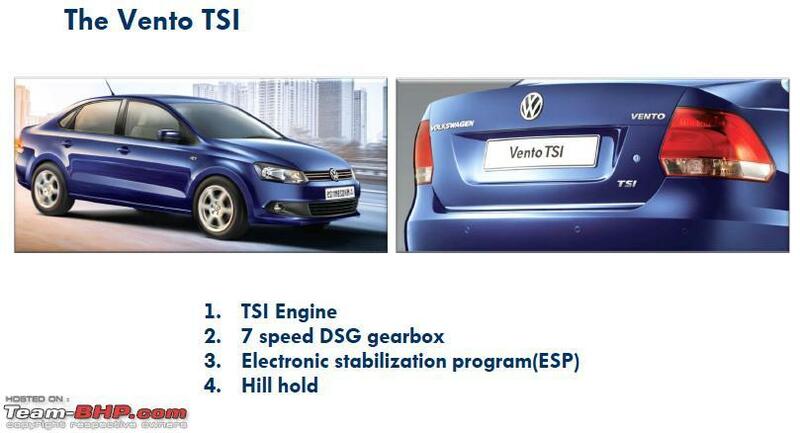 Proving wrong to all the rumours, Volkswagen India didn’t launch the Vento TSI on 03-10-2013. Now the fresh reports by Team-BHPian named Salman_Ferrari reveal that the TSI engined Vento sedan will be launched in the coming days, however, the exact date is unknown at the moment. This launch follows the Polo GT TSI, Polo GT TDI and Cross Polo, all of which came out in quick succession. The company has notified its dealers about the car and the name is ‘Vento TSI’ and not ‘Vento GT TSI’. The car looks similar to the existing variants on the outside, except the ‘TSI’ badging on the lower right corner of the bootlid. As far as interior is concerned, the Vento TSI will receive sporty Leatherette (artificial leather) seat fabrics and chrome accents. 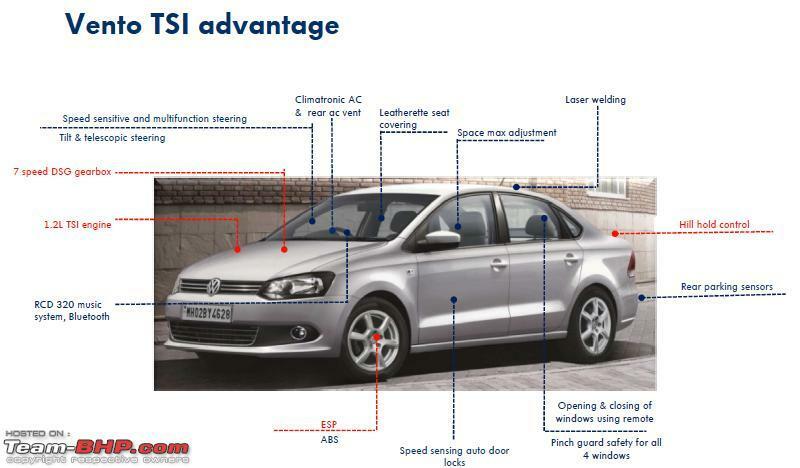 Apart from the styling upgrades the most important upgrade to the Vento TSI comes from the Polo GT TSI’s 1.2-liter four-cylinder TSI engine which is coupled to a seven-speed DSG gearbox. Although the exact figures are not provided in the official document, we assume it to offer max power output of 105PS and peak torque of 175Nm with a 17.2kmpl of mileage. Also there are rumours that the Vento TSI is most likely replace the Vento AT, which makes do with the 1.6-liter petrol engine and a traditional 6-speed automatic transmission. Also, it remains to be seen whether Volkswagen will discontinue the MPI petrol engined variants of the Vento once the TSI engined variant makes its debut in India. The Vento TSI will be available only in the Highline trim, which means it would come with features such as ABS, Airbags, 2-DIN music system with Bluetooth and Aux connectivity, climatronic automatic air conditioning and a Multi-function display. Feature additions come in the form of ESP (Electronic Stability Program) and a Hill Hold function.